Jamie says: For the last three weeks, I’ve had this strong desire to do something artistic. I think the source of the inspiration was a Vera Bradley purse I recently purchased; the pattern is called Lime’s Up. The colors and the flower pattern just radiate with happiness and fun. I knew what I wanted to do- I wanted to paint something just like my new purse. I felt so Italian (and creative) last night. 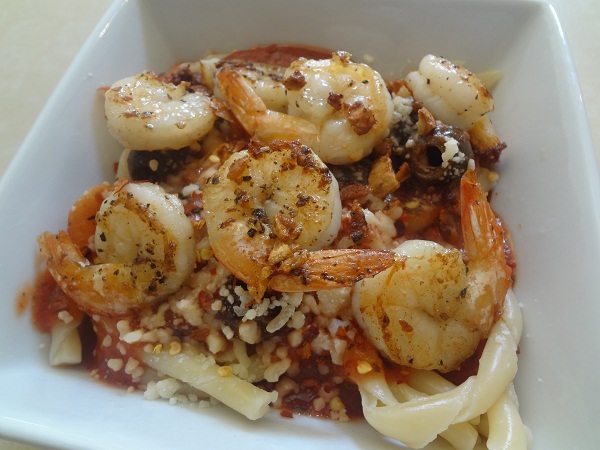 The Italian spiraled pasta was fun, and I especially loved the crispy garlic on the shrimp. In a small on low heat, add tomato sauce, parsley, basil, oregano, thyme, and black olives. Defrost shrimp in a small bowl of cool water, frequently changing the water until defrosted- for about 5 minutes. Drain. Pat with a paper towel. Fill a medium pot halfway with water. Bring to a boil. Add fusilli to boiling water. Cook for 11 minutes. Drain. Mince garlic. Pour extra virgin olive oil in a medium saute pan on medium heat. Add minced garlic and heat until golden brown, about 2 minutes. Add shrimp to garlic and oil along with sea salt and freshly ground pepper. Cook for about 3 minutes on each side or until pink and golden in color and cooked throughout. 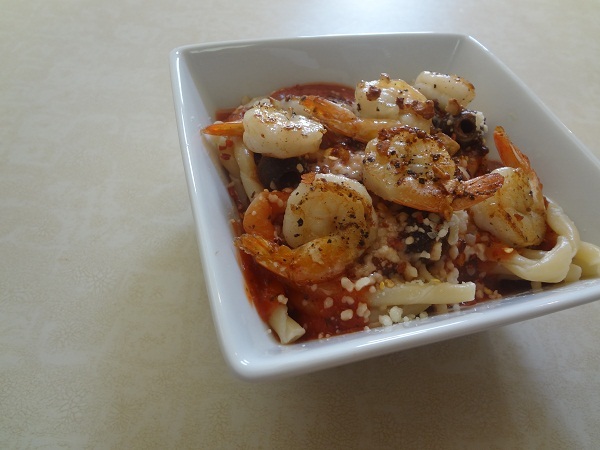 Serve pasta in a bowl topped with red sauce, crushed red pepper, Parmesan cheese, and then the garlic shrimp. Enjoy! 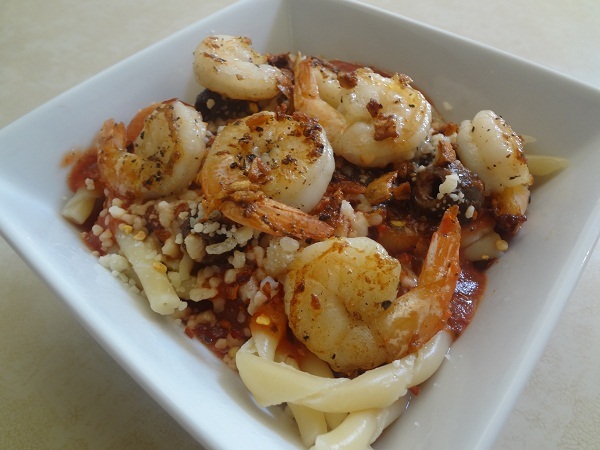 Nutrition note: Keep your pantry stocked with key meal items like pasta and tomato sauce and your freezer with a bag of frozen shrimp. For those days when you have limited fresh groceries on hand, you’ll still be able to make a delicious meal. 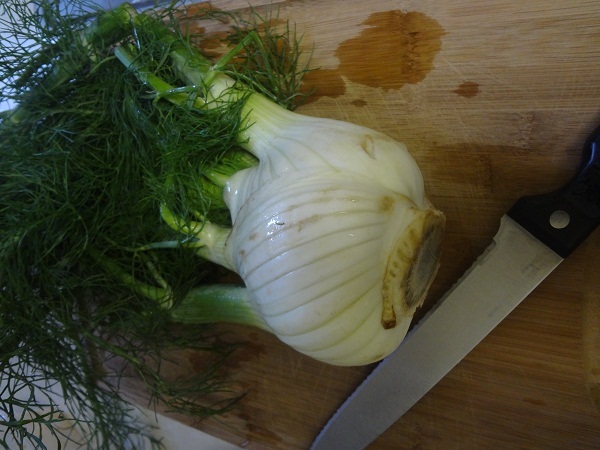 Don’t let this bulb of fennel intimidate you. Pick one up at the grocery store…and get to work in the kitchen. 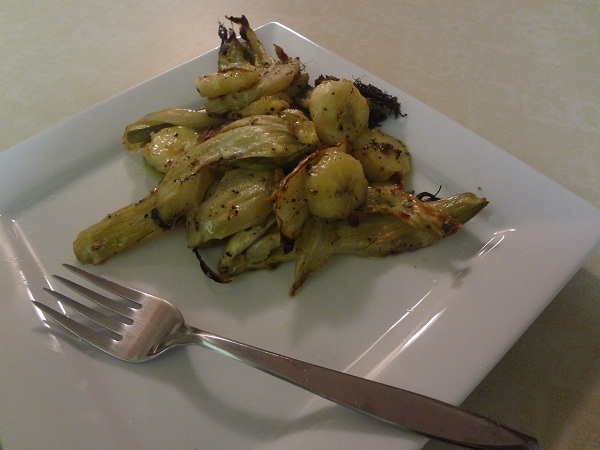 Then you can easily make- Roasted Fennel with Tender Bananas. It’s easy to make. It’s awesome! The fennel and bananas get nice and tender. 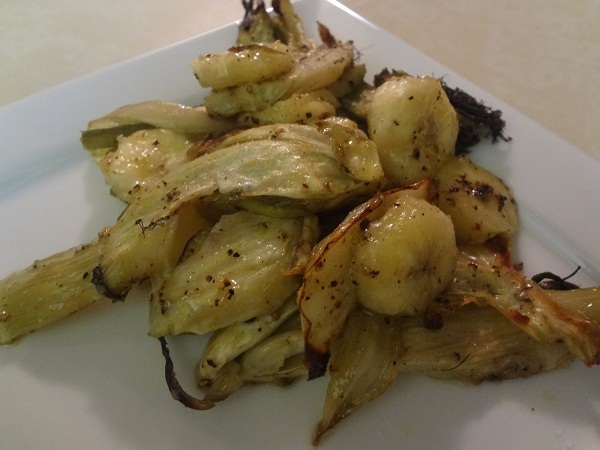 The bananas are sweet, like plantains, and the fennel is nicely salted with a mild licorice taste. I would definitely recommend serving it with baked salmon. It makes the perfect topping… or you could totally eat it on it’s own as a side dish. Preheat oven to 365°F. Cut leaves off fennel bulb, discard. Cut bulb in half. Lay cut-side down on a cutting board and sliced. Place in a large baking dish, drizzle with extra virgin olive oil, sea salt, and freshly ground pepper. Toss to coat. Bake for about 50 minutes or until tender and light brown. When fennel has 13 minutes of cook-time remaining, rinse salmon and place, skin-side down, on a small baking pan. Bake for about 12 minutes or until cooked throughout and center flakes with a fork. When fennel has 7 minutes of cook-time remaining, slice banana into 1/4″ circles and add to fennel in oven. Mix banana in with fennel. Continue baking, with fennel, for remaining cook-time (about 6 minutes) or until tender. 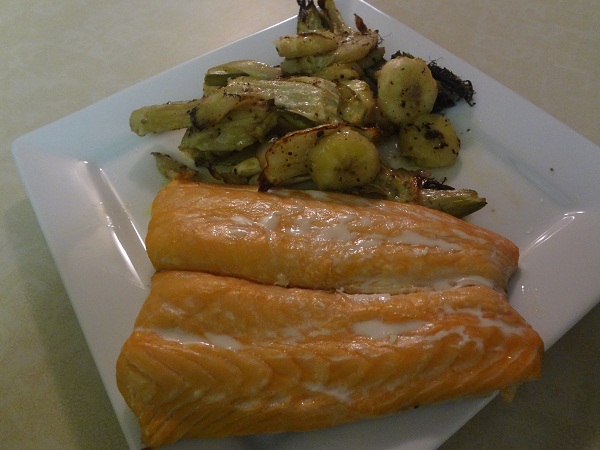 To serve, divide salmon and roasted fennel with bananas among two plates. Roasted fennel can be served on the side or on on top of salmon. Enjoy! Nutrition note: The fats from the salmon and extra virgin olive oil are heart-healthy. This meal provides a protein, fruit, and vegetable, too. Jamie says: I made this dinner in under 5 minutes. I had to. I needed a quick meal, because I made an appointment for a massage that I definitely didn’t want to be late for. I was hoping dinner would be sustaining and somewhat tasty. I didn’t expect it to be absolutely amazing- but it was! Can’t get much better than that- a delicious meal and a massage… what a night! 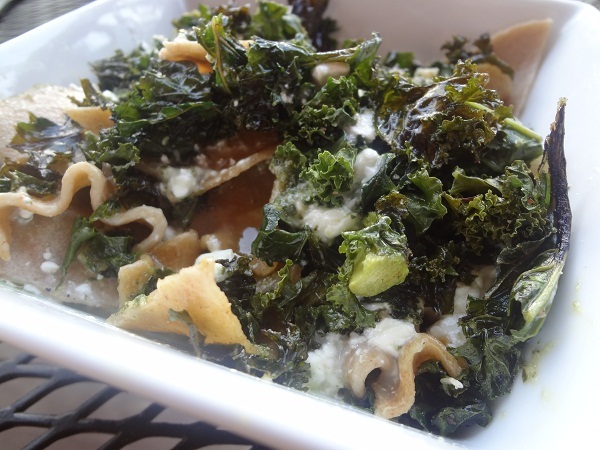 The reason it took me less than 5 minutes was that I had previously cooked the lasagna noodles (and had frozen them) and the Garlic Kale Chips (and refrigerated them). I also had pesto on hand in the freezer. So, I just tossed those three ingredients in a bowl along with some cottage cheese and microwaved the meal. 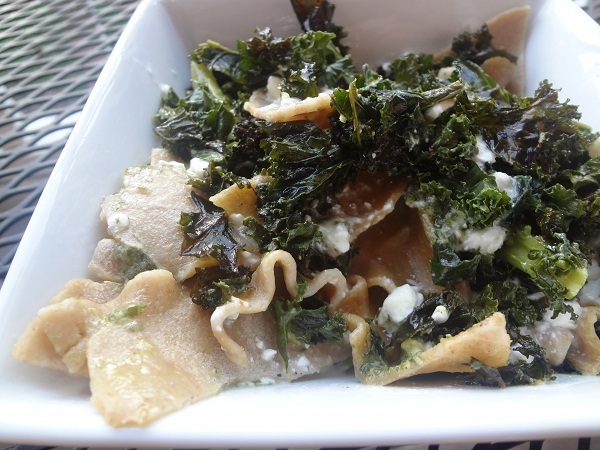 Since most people probably don’t have frozen lasagna and cooked garlic kale on hand, I wrote the recipe from the beginning, but you could definitely freeze these ingredients and have a quick dinner like I did one night. I took the bowl with me out the door and made it to my destination on time and well-fed. This ain't your average lasagna! It’s not your typical lasagna- it’s quicker and easier and still absolutely delicious! Cottage cheese? Yes! And it was delicious! Fill a medium pot 1/2 full with water. Add lasagna pieces one by one. Gently stir to make sure they are all covered by water. Cook for 10 minutes. Remove with tongs and lay on wax paper so the pasta doesn’t stick. Chop lasagna into large, bite sized-pieces. 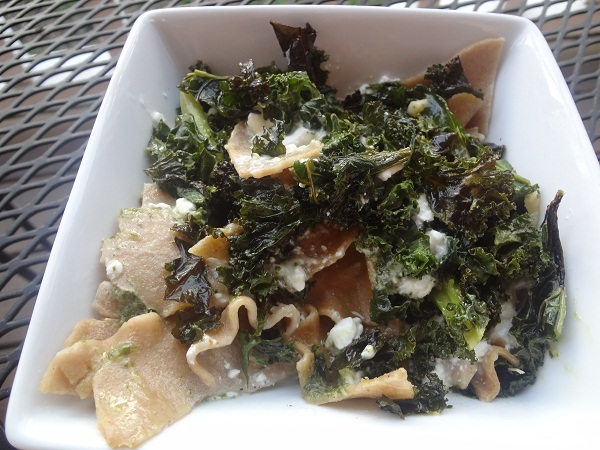 In a serving bowl, combine chopped lasagna, pesto, cottage cheese, and Garlic Kale Chips. Stir. Microwave for 1 minute or until warm. Enjoy! Jamie says: Oh, the power of suggestion! My amazing friend Clarissa and I were talking about food today on our kayaking adventure (on which we saw about 10 alligators, by the way). We were on the subject of cottage cheese, and she mentioned how tasty it was to top a salad with cottage cheese. I’ve seen cottage cheese at salad bars but honestly, I found it peculiar, and never thought to put it on a “lettuce salad.” Clarissa also mentioned how a friend made her dinner and there was an awesome salad with seasoned nuts. 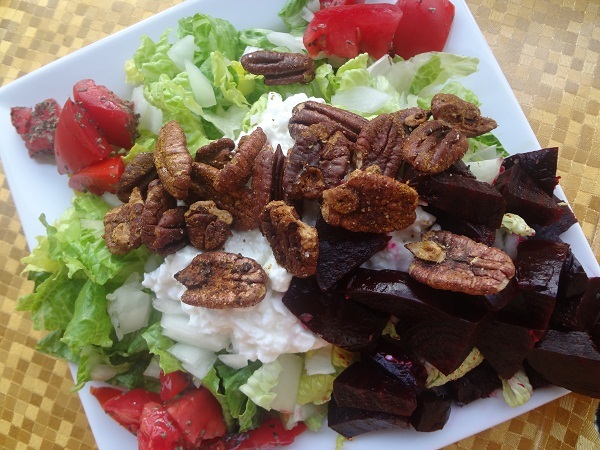 I put the two ideas together and invited some creative freedom and made a Beet & Spiced Pecan Salad with Cottage Cheese. 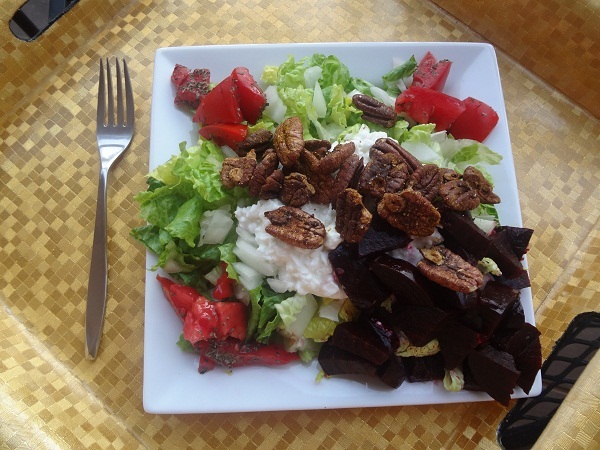 The beets were so tender and flavorful, and the nuts had the perfect combo of spices- sweet and salty. The cottage cheese brought the dish together quite nicely. It was so good, I toasted a second batch of pecans so I can make another Beet & Spiced Pecan Salad with Cottage Cheese for lunch tomorrow. Preheat oven to 350°F. Rinse beets. Place a large sheet of aluminum foil in a baking dish. Pull foil up around beets like a boat. Add water. Pinch foil shut. Bake for 1 hour and 30 minutes or until soft when pierced with a fork. Allow to cool. Peel skin off beets. Refrigerate until cool. (Save beet juice for a Beet Orange Smoothie with Arugula). Preheat oven to 350°F. Spray a baking pan with no stick cooking spray. Place pecan halves on pan and spray both sides with no stick cooking spray. Sprinkle with sea salt, freshly ground pepper, curry, cinnamon, nutmeg, and ginger. Mix. Bake for 12 minutes. Remove from heat. Allow to cool. Chop lettuce, onion, and tomato. Sprinkle basil on tomato. Place chopped lettuce on a plate. Top with chopped onion and tomato. Scoop cottage cheese into center of salad. 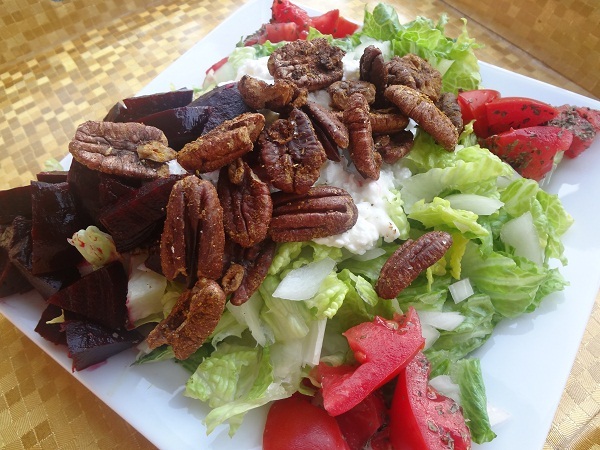 Chop beet and place on salad along with Spiced Pecans. Enjoy! Nutrition note: Looking for non-meat sources of protein? Cottage cheese and nuts and two good options.